Terai region of Lumbini Zone situated between Narayani and Rapti rivers is an important site for the Buddhist as well as Archaeologist. 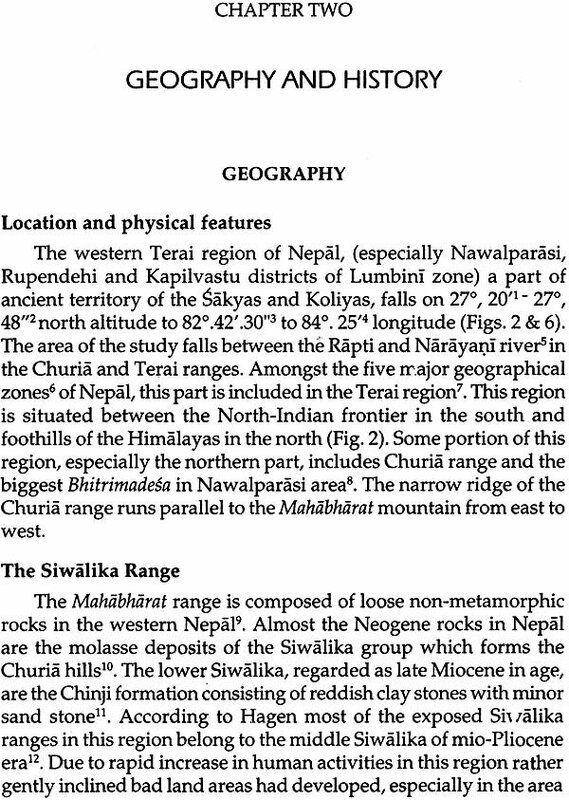 This region was associated with the Sakyas and Koliya at Kapilvastu and Ramagrama (Devadaha) respectively in ancient period. Lumbini, the birth place of Lord Buddha, Kapilvastu, capital town of Sakyas, Ramagrama (Devadaha), maternal house of Buddha, and other ancient archaeological sites are located in this region. 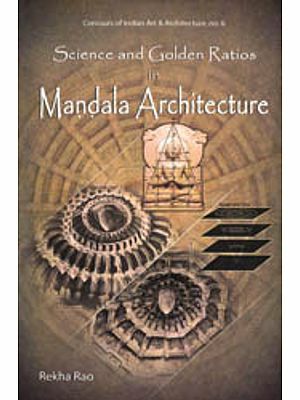 This book throws light on history, archaeological sites, identification of ancient Buddhist sites, especially Lumbini, Kapilvastu and Ramagrama, art, architecture and touristic importance of the region. The book contains geography and history of the region in brief and excavated and explored sites from where a number of art-remains has been obtained in course of archaeological activities. In the fourth chapter various Buddhist texts, excavated reports, versions of eminent scholars and Chinese account have been discussed to identify the ancient capital town of Kapilvastu. The evidences suggested that this region along with some portion of North-India, including Ganawaria and Piparahawa, had been a part of the ancient Kapilvastu. In the fifth chapter, the art-remains, viz. stone sculptures, other stone objects, humans and animals terracotta figurines, other terracottaobjects, seals and sea lings, coins, potteries etc. are incorporated. The result of the analysis of terracotta figurines has been incorporated here, highlighting the origin, typology and stylistic evolution of the principal forms, their techniques and contexts. This helps us to place the changing art forms and style from the pre-Mauryan to Pala-Sena periods in proper perspective. The earliest figurines are related to the female group. Terracotta trading and industries associated with them were similar to the contemporaneous sites in North-India, specially Hastinapur, Ahichchhatra, Kausambi, Taxila, Sohagaura and Arikamedu. On the basis of these sites relative dating has been adopted in the region. Pottery of various traditions, e.g. P.G.W, N.B.P. and Red wares were also discovered which helped us in fixing the chronology. The book goes into a deep study of archaeological sites and art-remains which helps for preservation and conservation to the authorities in future. Photographs, drawings and maps have been included to make the volume more authentic, informative and attractive. Dr. Gitu Giri, M.A., B.Ed, B.L., Ph.D. born on 21, May 1955, at Maranthana Pyuthan, was educated mainly at Tribhuwan University, Nepal and received the degree of Doctor of Philosophy from DDU Gorakhpur University rewarded Fellowship by University Grants Commission of Nepal in 2001. He was involved as Assistant Researcher in research project on the "Sacred Complex of Ruru Kshetra," sponsored by UNESCO & has completed four research projects funded by Research Division, Research Center for Nepal and Asian Studies, Tribhuwan University & University Grants Commission of Nepal. He was appointed as member of Central Subject Committee, Nepalese History, Culture & Archaeology Department, T.U. from 1997 to 2000. He has lectured at various Campuses of Tribhuwan University and at present is working as Lecturer and Chairman at Bhairahawa Multiple Campus of Tribhuwan University, Bhairahawa, Lumbini, the birth place of Lord Buddha. He is also an Associate Editor of Journals and active member of civil society. His major interest lies in the study of different dimensions of Nepalese culture, art, architecture and archaeology, especially western region of Nepal. Art is an effective medium as expressing the soul of human civilization. Art specimens reflect not only the socio-culture, economic and religious modes and thoughts of a community, but also delineate its artistic tradition. The present study has been designed to meet a new awakening of general interest in a wider world in cultural modes and art treasures in the Terai Region of Lumbini Zone of Nepal. The purpose of the present study is to present in a somewhat integrated manner the plastic arts of the region in the context of the life style of the people and their history, religion and culture. Archaeological field work during this century has for the first time brought to light the culture milieu manifested in Nepal from the Paleolithic age upto the Muslim period. Growing archeological data from the exploration and excavations (rarely horizontal) and the slow rate of publication of the results has hampered a proper understanding of the historical developments. Some attempt by has been made recents to study the art tradition of the cultural modes with special reference to their time and space. 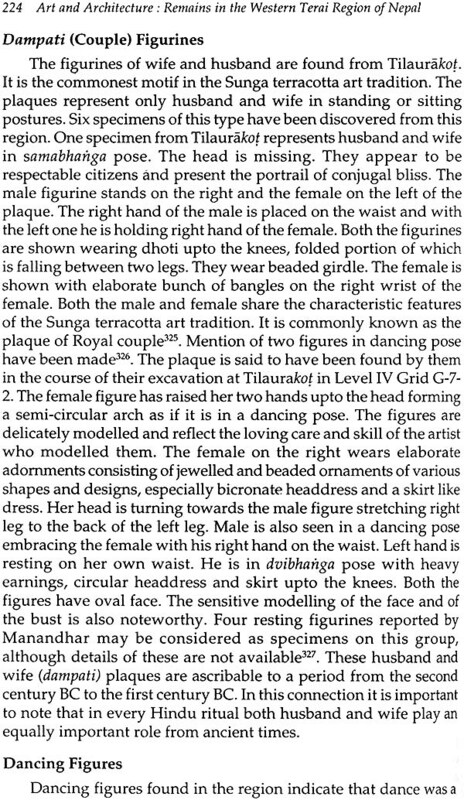 The present work aims at understanding the historical developments, architectural and art form as well as style related to the various cultural remains that were found in course of excavations in the region of Nepal dating from 800 Be until 1400 AD. This book is divided into seven chapters. In the first chapter a brief introduction discussing the problems, objectives of the study, review of literature and the basic approach adopted is incorporated. The second chapter contains geography and history of the region in brief. The third chapter deals with the excavated and explored sites from where a number of art remains has been obtained in course of archeological activities. Findings from Tilaurakot, Lumbini and Bafijarahi have helped us to decide the demarcation lines of the various cultural phases. In the fourth chapter various Buddhist texts, excavated reports, versions of eminent scholars and Chinese account have been discussed to identify the ancient capital town of Kapilvastu. 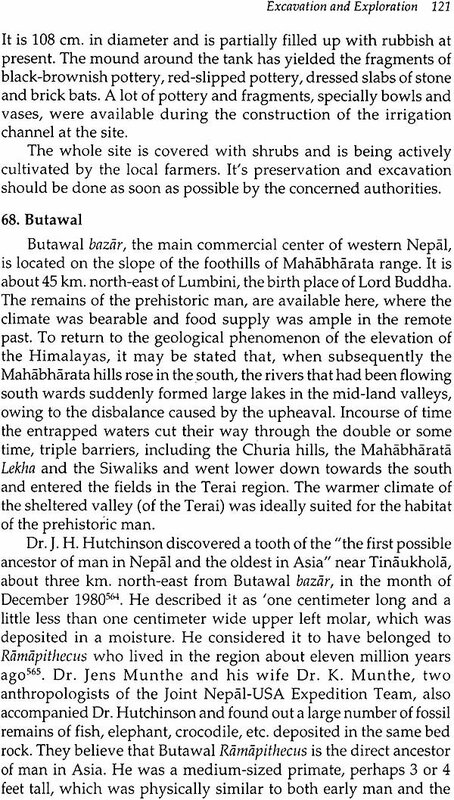 The evidences suggest that this region along with some portion of North-India, including Ganawaria and Piprahawa, had been a part of the ancient Kapilvastu. 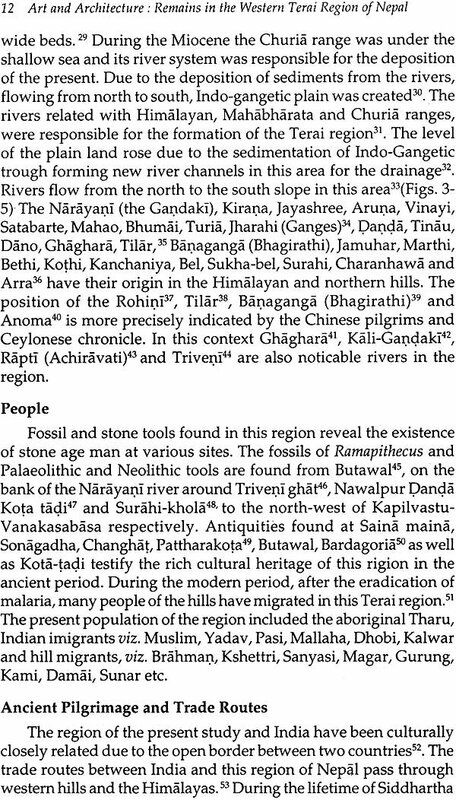 These evidences are more in the favour of Tilaurakot than Ganwaria being the capital town. Chapters five and six are the main contributions of the present research work. In the fifth chapter, the art remains, viz. stone sculptures, other stone objects, human and animal terracotta figurines, other terracotta objects, seals and sealing, coin, pottery etc. are incorporated. Stone sculptures of Vishnu Siva, Ganesa, Karttikey, Surya, Devi and Buddha have been described in chronological order. Vishnu is represented in traditional as well as anthromorphic forms in the plastic art. U1e aniconic form of Siva is the Linga, which are plain and mukha Lingas, Surya is represented in symbolic form of a deity. Almost all the images of Hindu goddess are found in this region. Various forms of Buddha images are also recorded from this area. The terracotta figurines have played a vital role in the field of art from the ancient to modern period. With a view to study, the terracotta figurines from this region, a survey of all the available excavated materials, as well as explored materials, were undertaken. The result of the analysis has been incorporated here, highlighting the origin, typology and stylistic evolution of the principal forms, their techniques and contexts. 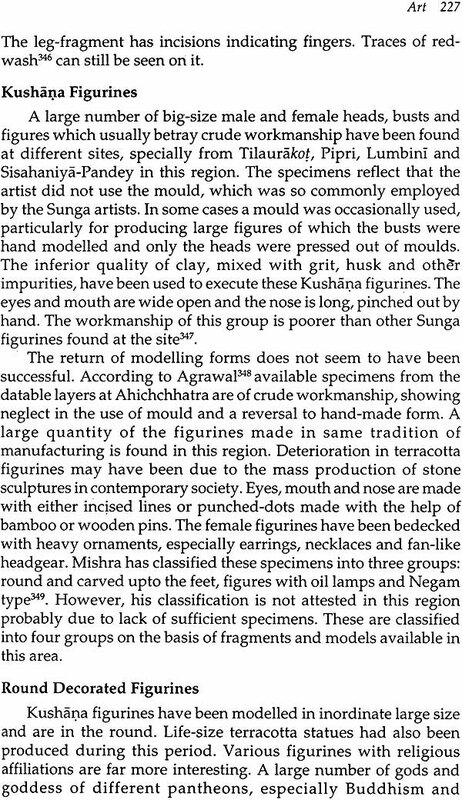 This helps us to place the changing art forms and style from the pre-Mauryan to Pala-Sena periods in proper perspective. The earliest figurines are related to the female group. Terracotta trading and industries associated with them were similar to the contemporaneous sites in North-India, specially Hastinapur, Ahichchhatra, Kausarnbi, Taxila, Sohagaura and Arikamedu. 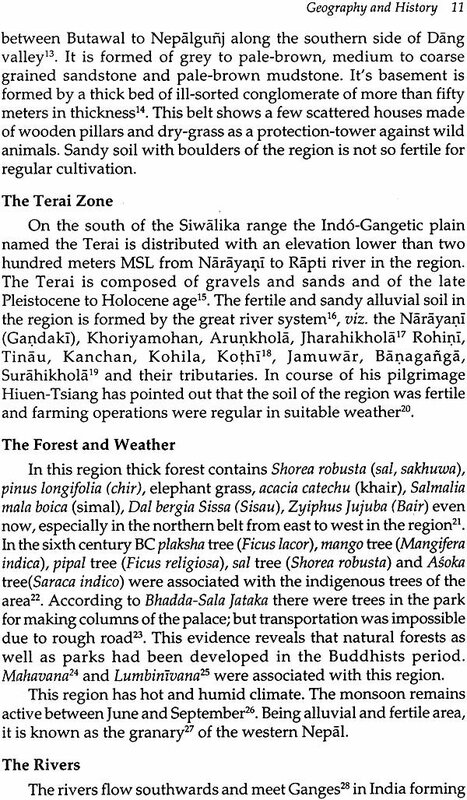 On the basis of these sites relative dating has been adopted in the region. Pottery of various traditions, e.g. P.G.W, N.B.P. 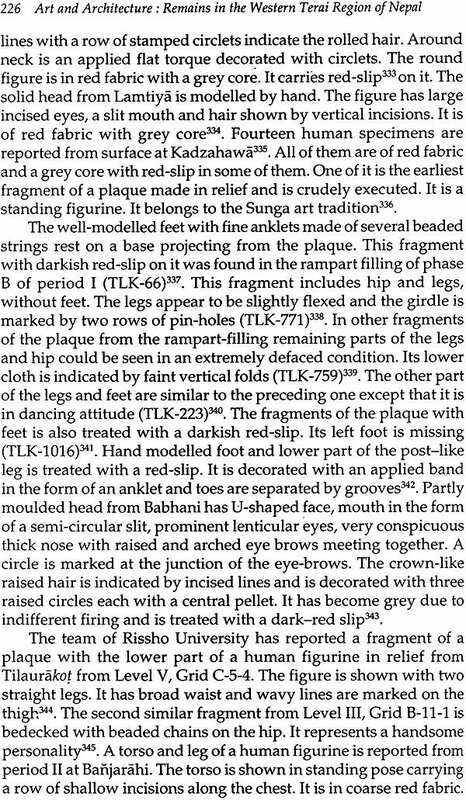 and Red wares were also discovered, which helped us in fixing the chronology. These remains have special significance for understanding the esoteric import for the spiritual growth of the human beings in this region. Various forms of art, symbols, weapons, musical instruments, agricultural implements, ornaments, garments and other attributes have mystic implications of spiritual significance for aspiring devotees. The sixth chapter deals with various forms of the architectural tradition of the region, especially religious and secular architecture. 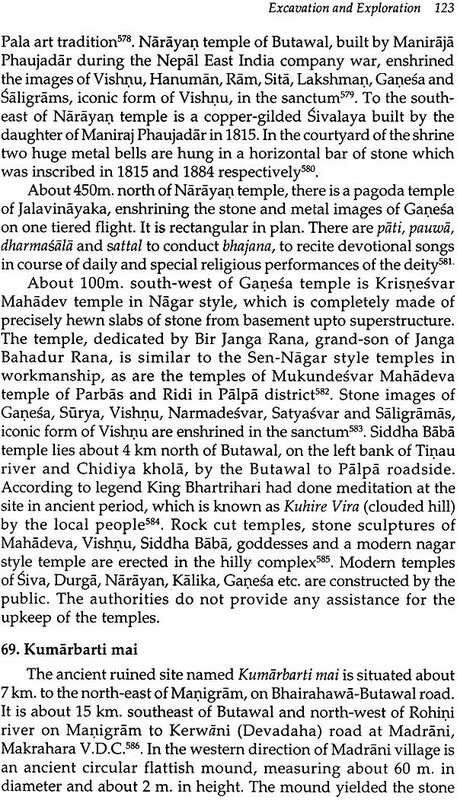 The Hindu temples, forts, fortified- complex, town-planning etc. have also been discovered in this region. The last chapter deals with an overview of the findings and incorporates important conclusions arrived at and some recommendations suggested for future work to be undertaken in the area of study and research. The cultural dimensions of the Terai region of Nepal have been evolved from the stone Age to the medieval period on the basis of art remains available in the area. This book will be very useful to the students, teachers, archaeologists, tourists as well as related authorities. Art is a subject of great importance as expressing the soul of human civilization. Among the various mediums of art, especially stone, wood and terra cotta objects, being a cheap and simple media of expression and within the reach of poor and common man, can be considered to be of immense value in the reconstruction of the social, cultural, political and religious life of the contemporary people. Availability of a large quantity of remains of art and architecture have been reported from many sites e.g. Tilaurakot, Kudan, Sagrahawa, Bikuli, Sainamaina, Lumbini etc. from time to time in the region. No attempt has so far been made by the scholars to study in proper perspective and make use of them in the manner they actually deserved. Only limited excavations and casual reports from certain places have been studied by a few scholars for the reconstruction of the cultural life of the synchronous times. A comprehensive study may not be possible in the case of those sites which have yielded only a limited number of art remains. At the same time the study of such sites, where a large number of art remains have been brought to light, should not wait for further future data. The significance of this study is to throw light on the historical development with the help of explored and excavated ancient material, and to analyse and document the art material of the region as well as to identify ancient Kapilvastu and the places in the area with the various sites and events mentioned by Chinese pilgrims i.e. Fa-Hien and Hiuen-Tsiang. The study is mainly based upon art remains, viz. stone sculptures, terracotta figurines, seals, sea lings, beads, bangles, coins, dabber, flesh rubber, ivory, pottery and architectural apartments. On the basis of such a study the researcher has tried to reconstruct the social, economic, religious and cultural matrix of the contemporary people. This study has brought to light a large variety of terra cotta remains, monumental and habitational structures, plastic art pieces, which throw considerable light on the characteristic features of the art and artists during the pre-Christian and early Christian centuries. This study has brought to light a lot of hidden knowledge and given a new dimension to the social, religious, economic and cultural history of Nepal. In the light of this study of the history, art, and architecture of the region the government may be able to make plans and programs for the conservation and preservation of important historical and archaeological monuments and the works of art decaying every day in the absence of their proper care, and thus would be useful, if preserved, for the posterity and also for the growth of tourism in this region. All the previous works done in the area have been taken into consideration and properly interpreted for the preparation of various chapters involved with the study of art remains and to identify the important sites in the western Terai region of epal, Only a brief mention of the previous work is being done here. 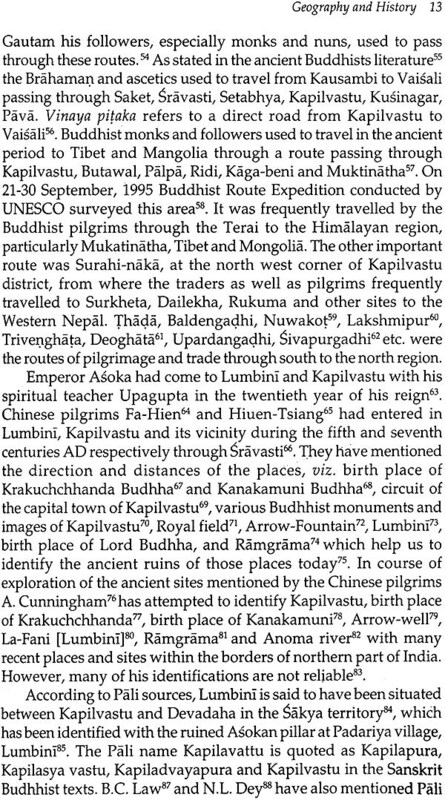 In the course of the identification of ancient Kapilvastu, Lumbini and other sites on the basis of the Buddhist literature and Chinese records, Dr. Lassen, M'S. 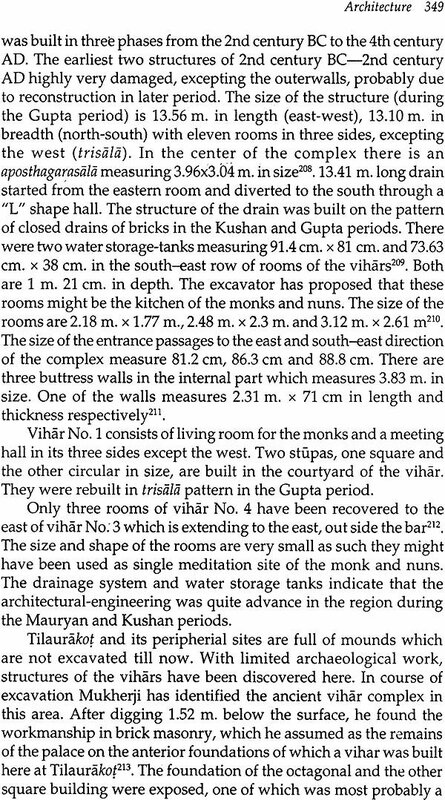 Julien, A. Cunningham and Carllyle tried to identify the above places with the various sites around Gorakhpur in Uttar Pradesh, India. But they did not get chance to explore these sites in this region due to the heydays of the Raf.1as in Nepal during this period. In March 1895, A. Fuhrer found an inscribed Asokan pillar on the bank of Niglisagar. This discovery created great sensation among the archaeologists and orientalists. He got a chance to identify various ancient Buddhist sites in the periphery of Lumbini and Tiaurakot after finding the inscribed Priyadnrsi ldt (Asokan pillar) in Lumbini, the birthplace of Buddha near Bhagwanpur. During this period Khadga Shamsher J.B. Rana, Captain Birjung and L.A. Waddell had also contributed in the exploration of these monolithic pillars. W.e. 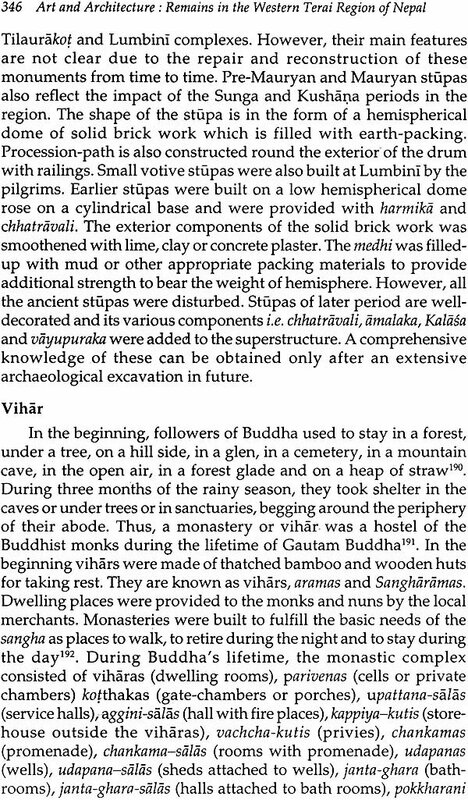 Pepppe's excavation at Piprahawa (Basti district, now Siddarthanagar district in India) has also supported that the ancient Kapilvastu region must be very close to it. After Fuhrers retirement P.C. Mukherji was deputed to complete excavation as well as to explore the area, to prepare records in the form of drawings, estampages, maps and photography, to locate and plot precisely Kapilvastu and its peripheral area. During this period Major Waddell was also permitted to conduct his own investigations in this area. Mukherji' s report and drawings represent a fair judgement of his faithful and keen observation. Vincent A. Smith has also commented and explained the Mukherji Report as instructed by then authorities. During 1933-39 General Kaiser Sharnsher J.B. Rana had provided a high platform around Mayadevi Temple, enlarged the Sakya tank with successive terraces and built some rest houses in Lumbini. 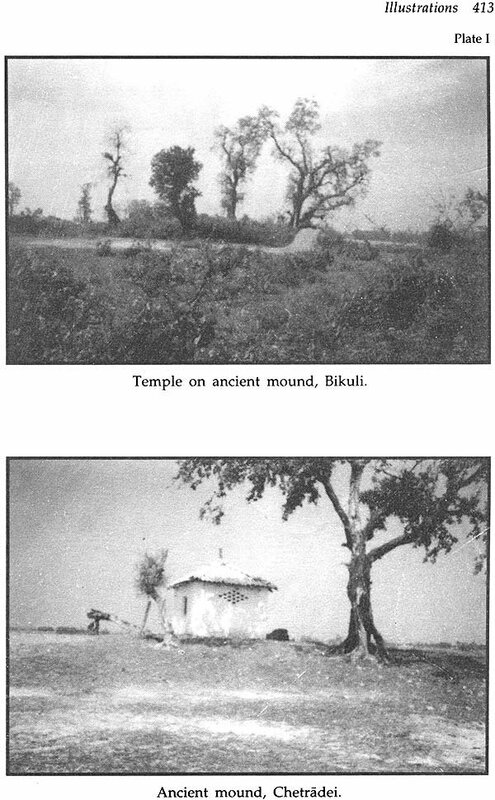 In 1962, Debala Mitra conducted excavation at Tilaurakot and explored the region. On this occasion she classified the art remains into various groups on the basis of their size, shape, model, use and medium in a scientific way. In 1964 Shantaram Bhalchandra Deo had conducted excavation at Banjarahi and Paisia,' southeast of Lumbini from where mud- houses belonging to the eighth century BC were also exposed. On this occasion he explored nine sites between Lumbini and Narayani river. 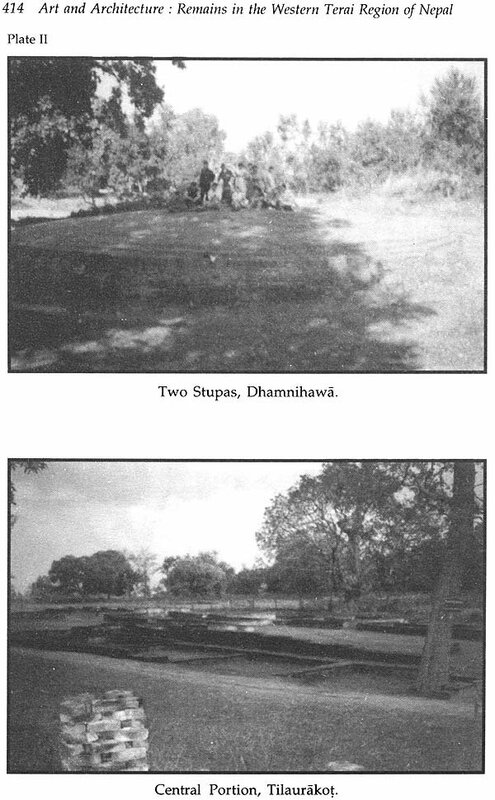 During 1967-72 a team of the Department of Archaeology, under the leadership of Tarananda Mishra had excavated the defense walls, the western gateway of Tilaurakot and twin stupes at Dhamnihawa. During 1967-77 a team of Rissho University consisting of Z. Nakamura and H. Sakazume also excavated in the central mound of Tilaurakot complex. But the team has not published the excavation report (except the illustrations) even now. In search of prehistoric tools, N.R. Banerjee and Janak Lal Sharma found Neolithic stone tools from Nawalparasi. of which one is known as a unique piece. In the process of a critical study of the previous reports and on the basis of field study, Ram Niwas Pandey wrote some articles about art and architecture of this area, especially of Kapilvastu. During the period 1971-78 many teams of the Department of Archaeology, H.M.G Nepal, excavated at Lumbini and Tilaurakot under the leadership of Babu Krishana Rijal and Tarananda Mishra. In course of these excavations, they recorded successive human deposits in the southern mound in Lumbini, dating from the sixth century BC upto the Gupta period. One group of sixteen stupas, and another group of five stupas were exposed from here belonging to a period ranging from the Mauryan to Kushana periods. In 1980 a joint team of U. S. A and Nepalese scholars found a fossil of the upper left jaw of Ramapithecus, c. 11 million years old, from Butawal on the bank of Tinau river. 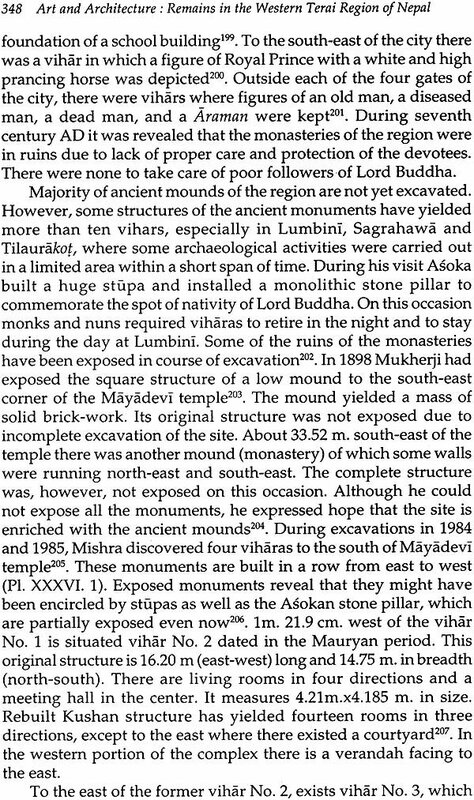 The excavation and exploration had been conducted under the aegis of the Department of Archaeology in Lumbini, at Tilaurakot, Ramagrama (Deurawa) and other sites during 1979-84. Tulsiram Vaidya, Triratna Manandar, Ram Niwas Pandey, Loka Darsan Vajracharya and the Department of Archaeology have presented important evidences to identify ancient Kapilvastu with Tilaurakot and its vicinity in this region. A tribunal team of Japanese Buddhist Federation, Lumbini Development Trust and Department of Archaeology excavated the foundation of Mayadevi temple in Lumbini during 1992-96. A team of Instituto Italiano Per Medio Ed Estremo Oriente (IsMEO) excavated the ancient stupa at Cothihawa which was already noticed by Waddell and Mukherji. 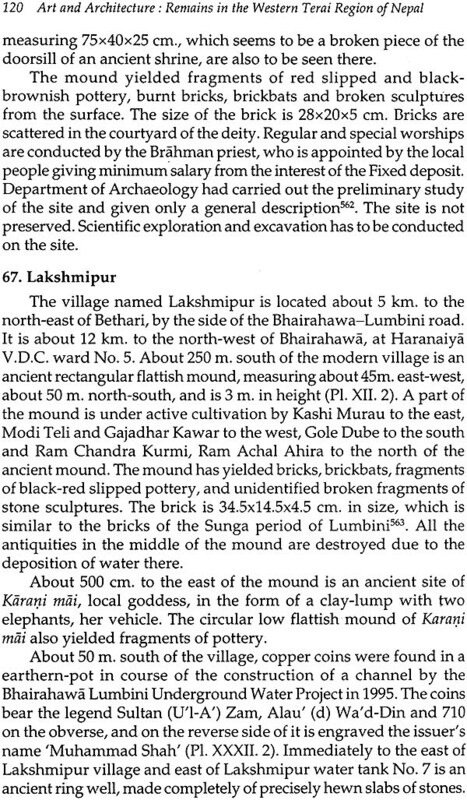 In this context, the Bradford University Team of United Kingdom in collaboration with the Department of Archaeology of Nepal and the financial support from UNESCO World Heritage Committee conducted excavation at Ramagrama during 1997-2002. The researcher has already completed three research projects and submitted the reports for the years 1995-97 to the Research Division, Tribhuvan University, Centre for Nepalese and Asian Studies, Tribhuvan University and University Grants Commission Nepal. Unfortunately, the teams, which conducted excavations in Lumbini- Tilaurakot from time to time, have not published their proper reports even now. Archaeological activities were limited during the last century and no proper exploration and excavation could be carried out due to lack of sufficient budgets and skilled manpower. 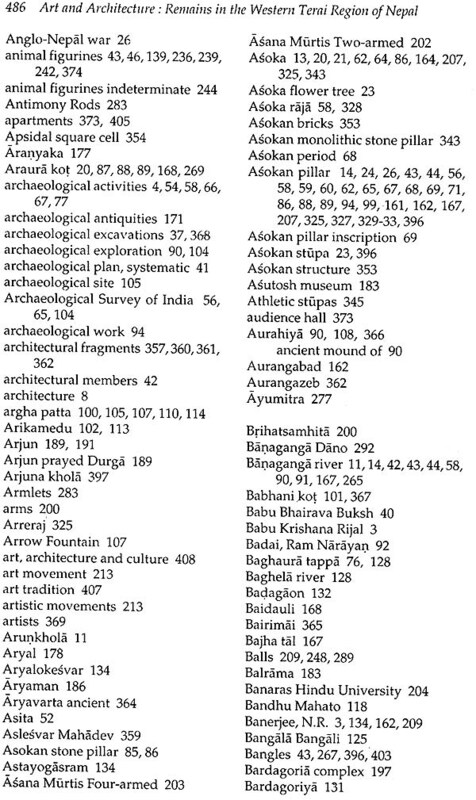 Books and papers available are mostly the copies from the excavation reports. Due to the peculiar scope and informative character of the papers and books, the accounts mentioned there are not so valuable for the enlightened scholars and experts of the subject. Their descriptions are not reliable due to lack of original sources, reliable informations and their proper interpretation, as well as, paucity of proper knowledge of the discipline. They have not mentioned in detail the geography and history of the ancient period of the region. Similarly, no detailed information of the explored and excavated sites and their identification, art and architecture of the region during the eighth century BC and the thirteen centuries AD is found elaborated in their works. 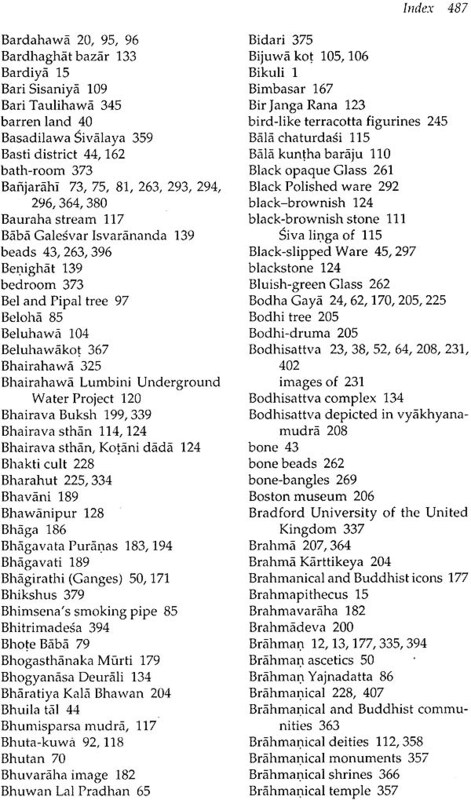 Only short accounts about a few of the art remains are to be seen in the reports of Mukherji and Mitra. Religious and secular architecture is not classified on the basis of their use and sects. None of the scholar mentioned above describe in detail the technique and tradition of town planning, house planning and the Royal palace in the ancient period. They have not given the details of art remains, especially stone sculptures, terracotta figurines, seals, sealing, beads, bangles, coins etc. in their publications. 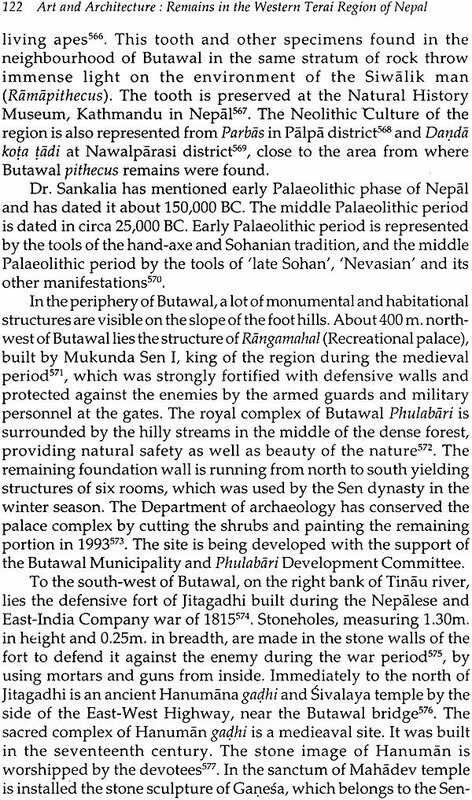 Despite the best efforts of the scholars mentioned above, no proper exploration has yet been done in this region and a scientific study of history, art and architecture of the western Terai Region of Nepal remains incomplete, even today. The present study is an effort to throw light on the economic, social, cultural and political life of the ancient western Terai region of Nepal on the basis of art remains during the period of study.